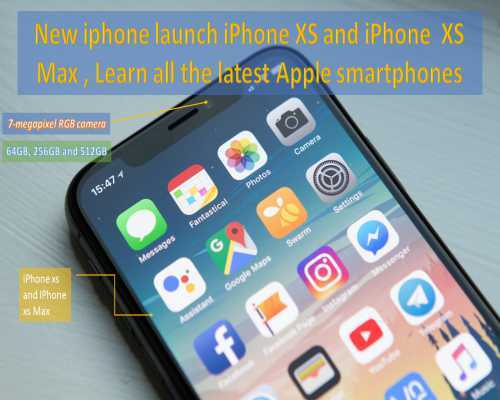 New iPhone launch iPhone XS and iPhone XS Max, Learn all the latest Apple smartphones:- After all, new iPhone models have been launched. Three new iPhones have been introduced. Its price and availability in India have also been announced. Three new smartphones have been launched during the Apple event - iPhone XS, iPhone XS Max, and iPhone XR. Two of these smartphones seem to look the same. You can say that both of them look like the iPhone X. No further changes have been made to the design. Although they will be available in the iPhone XS and XS Max Gold Color variants, which will make them look different. The iPhone XR is a low-cost iPhone and has an LCD display. We tell you about the iPhone XS and XS Max in this story. New iPhone XS and iPhone XS Max Mobile will be available in India from September 28. According to the company, the 64GB variant of the iPhone Xs will cost Rs 99,900, while the price of 64GB iPhone Xs Max is Rs 1,09,990. Apple has given the A12 bionic processor in both of these smartphones, which is a six-core chipset. According to the company, it is the industry's first chipset that works on a 7nm process. Tim Cook said that this iPhone is by far the most advanced model. There is a better dynamic range display and stereo speakers are capable of delivering better sound quality. The display of the iPhone XS Max is large enough to be 6.5 inches i.e., Samsung's flagship is bigger than Galaxy Note 9. IOS 12 is delivered in the iPhone XS and iPhone XS Max. The iPhone XS screen is OLED super retina and it is 5.8 inches. Display Noch is exactly the same as the iPhone Xs. The OLED panel is also used in iPhone Xs Max and it is 6.5 inches. However, the size of this phone is similar to the iPhone 8 Plus. ➤What is special in the iPhone Xs processor? According to the company, the A12 bionic chipset is 15 percent faster and consumes 40 percent less power. There are 4 efficiencies in this. Speaking of battery backup, Apple World's World Wide Marketing Senior Vice President Phil Schiller has said that the iPhone XS's backup is 30 minutes more than the iPhone X. While iPhone XS Max will back up more than 1 hour from the iPhone X. The body of these two new iPhone is made of stainless steel, which is of a surgical grade. Glass casing has been given on both sides of the smartphone. This design is also in the iPhone X.
iPhone X is also a water resistant, but in these new models, the company has given the IP68 rating for the first time, which makes it completely water and dust resistant. Wireless charging support is also provided on these smartphones. Apple has claimed that the Face ID given in these new iPhone models is the most secure facial authentication available in any smartphone. For this, the company has used the hardware aggregation. Face ID has been given a dot projector technology which makes it special. A dual rear camera is provided in iPhone XS and XS Max. it has a 12-megapixel wide angle lens. Its aperture is f / 1.8. The second camera is also 12 megapixels and it is a telephoto. Its aperture is f / 2.4. According to the company, a 6-Element lens has been provided in the rear camera which supports 2x optical zoom. Both smartphones have been given a 7-megapixel RGB camera for selfie, which has an aperture of f / 2.2. This time the rear LED also has been improvised. This time the company has given some options in portrait mode. Under this, you can change the Bokeh effects even after clicking on the photo. Indian users have long been demanding dual sim in the iPhone. This time Apple has also given dual-SIM support. Two numbers and two data plans can be run on both the smartphones. However, you have to use only one physical SIM for this. Because the concept of e-SIM is given here. By using a physical SIM and Apple integrated eSIM, you can use it as a dual sim. But for this, telecom companies will also have to provide eSIM support. However, this feature will be given after some time. According to the company, this feature will be available to people through new software updates in the coming time. This feature is expected to come to India. For China, Apple has specifically talked about offering dual SIM support at the iPhone XS Max. Because there is no concept of eSIM, therefore vibration in XS Max will give two sim slot slots. This has not been announced for India.